So after reaching out to the good folks over at Frontline Gaming, I have indeed gotten some more detailed data from the Las Vegas Open. One of the analyses I have planned is a bit of a beast, so rather than wait for that to be finished, I thought I’d put up a little side thought I had: How are the scores in tournament games distributed? Do they get closer in later rounds? This post was a little bit inspired by another blog musing about how to prevent really ugly first-round match ups in fun/narrative tournaments, because nobody wants to start their day of a friendly even by getting their teeth kicked in. I may have some more detailed musings on that later, but it prompted another, more fundamental question: What does the distribution of round-by-round scores actually look like? Is a tournament dominated by nail-biters, or blowouts? One might think, because of the way Swiss pairing works, that the scores narrow over time. The first round should be all over the place as lower-tier players (yours truly) get matched up with people who have the chance to go all the way, etc. 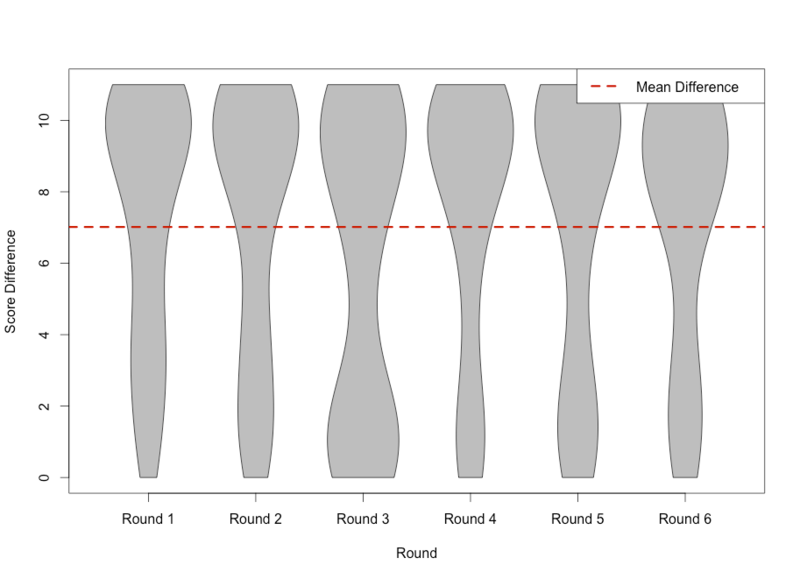 But later rounds are matching up people with similar scores – presumably those games should be somewhat tighter. This potentially has a big influence on the way you plan for a tournament: if the scores narrow over time, the relative contribution of early rounds to a player’s score is greater, making early morning games more important to carry. In this way it would work a little bit like the adaptive scoring system for the GRE test one takes to get into graduate school in the U.S. – the first few questions are massively influential on your score, while the last are at best going to change things by a point or two. This would also have implications for those tournament players who enjoy an adult beverage the night before, and might not be at their best for the first few games. But, as it turns out, this is not the case. Lets break this figure down a little bit. The odd shape for each round is the distribution of the differences in scores in that round – fatter areas indicate more games fell into that category. So, for example, that big bulge around 10 in round one? Indicates that a large number of the round one games had a total difference in scores between the players of 10. And overall, that’s a pretty consistent trend – every round has a hump at the “blowout” end of the spectrum, while really only Round 3 has a substantial number of tight games, where the difference in scores is quite close. Also interesting is that the “average” score (a ~7 point difference) actually happens quite infrequently: the average tournament game never really happens. Players score each mission in the ITC Scenarios separately, which then generate Mission Points to determine who wins the scenario. The Dawn of War and Maelstrom missions are worth 4 Mission Points if won, 2 mission points to each player if the mission is tied, and 0 mission points if the mission is lost. Each Bonus Point is worth 1 Mission Point. This generates a score of between 0-11 Mission Points. The preponderance of 10 and 11 point differentials in the results indicates that, generally, the army that carries Dawn of War is also carrying the Maelstrom missions and picking up bonus points. If the intention of the different objective types are to have different armies claiming different aspects of the mission, followed by a showdown to see if being stronger in one area or another is enough, that seems to only happen in a minority of games. Alternately, it could simply mean that tournament-level Warhammer 40K isn’t actually a game that produces close results, but is rather dominated by a “go big or go home” paradigm where there’s always a very clear winner. There are likely other explanations that I’m not seeing at the moment, and I’d be interested to hear them. Determining which is the case is, in the immortal words of any number of academic papers, left as an exercise to the reader. So does this mean tournament 40k is mostly rock, paper, scissors until you get to the highest levels? Wins in either dawn of war or maelstrom were worth 4, while they were worth zero if lost or tied at LVO (the missions changed after LVO to make ties worth 2 points). I have been going to grand tournaments for over ten years and I can say that in fact it is go big or go home. You want decisive victories in especially in Margin of Victory tournaments but also in W/Loss tournaments for pairings vs more passive armies. You would think that it would be ok to design an army that can eek out games vs a wide array of opponents but ultimately what that army really does is win less good than an army like say 45 warp spiders, complete psychic mastery phase manipulation or a million free points of models(admech and SM). Once you are in a dominate position early in any game it usually takes some pretty blatant “come from behind” mechanics or it becomes nearly impossible to win for the current underdog in the game state. The problem is GW has no idea what they are doing, people on the internet threw a ton of rage at Reece from Frontline for his early 6th edition reaction articles, and they decided to embrace maelstrom because it is “the way GW intends you to play the game”. The comment in italics is nonsense, they feed you missions as an after thought because you need guidance. You aren’t a minecraft player, you are a wargaming player. Of course few realize this and tons of people will look at any document GW produces as proof of GW design intent. I explored a bunch of competitive tournament concepts on my old defunct blog Laughter of Thirsting Gods. I cannot claim that these year old articles shouldn’t be rewritten but I do remember being proud of the content at the time. I play games of skill and chance for a living, only play games for their theme, so screw you MTG, 40k will always be that girl that cheats on me and I just don’t care lol. I mention Minecraft because GW says 40k is a sandbox game. Dig in and go crazy! That may work for a minority but not the vast majority. Organized play is what drives sales, not telling people to live the dream. If you want a truly balanced mission set you need enough kinds og goals that any one highly specialized army can’t easily fufill them all and enough LoS blocking terrain that they can’t just rampage the board with shooting and assault. That would force people to play the game instead of trying to win in the list building phase. The best players(not me) seem to always take advantage of changing conditions in the game state. The best mission I ever saw was 3 crusade objectives(10), 2 emperors will(capture and control in 5th edition, also worth 10 points), and KP for a 3rd group of 10 points. It forced you to not have too many units, as well as not too few less you risk not being able to attempt to control/contest the bare minimum of 2-4 of the 5 objectives. You also had to be able to get into their backfield which is something a gunline obviously hates to deal with. It was the best of times when that mission was super popular. The ITC missions are cool but they really emphasize MSU and while that might be fine in a vacuum that is actually not a good idea when people have access to so much free stuff and Death Stars have never had so many tools to get around the board/make themselves immune to attack. Previous Post: The Feast of Fluff: Results!